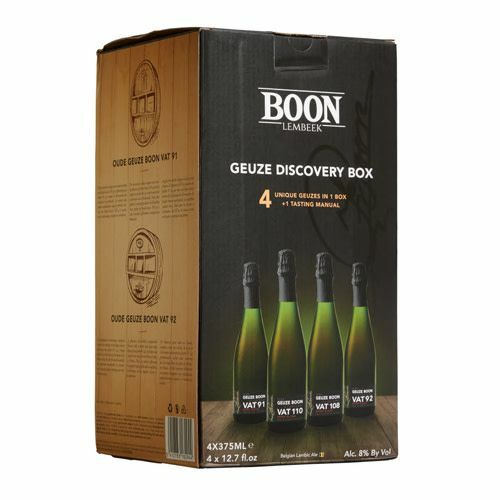 Boon Geuze – set of 4 VAT bottlings (VAT 91,92, 108,110) comes in a “Geuze Discovery Box” with a Tasting manual included to learn about the individual foeder n° that was used in which the lambic was matured to perfection before bottling. This traditiional Old Geuze is an Old Geuze from cask n° 91, used to serve as a calvados cask in Normandy, France. This foeder produces an excellent gentle lambic, soft and full bodied. Traditional Old Geuze from cask n° 92, used by wine makers in the Rhône Valley, France. VAT 92 is the favourite of the Boon tasting team: oakwood, complex and perfectly balanced, with smoky and spicy touches. 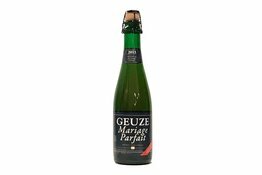 The very wine-like accents in this traditional Oude Geuze are combined with a distinctive 'old beer' character, which gives it a full-bodied and robust flavour, with unmistakable hints of volatile acidity that never overwhelm the sense. Foeder n° 110 used to serve as a cognac cask. 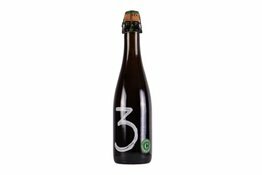 It gives Oude Geuze Boon VAT 110 its slightly dry but very full-bodied flavour, with a hint of vanilla and dry fruit.